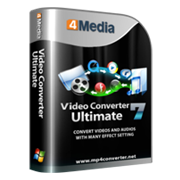 4Media DAT Converter helps you convert DAT file to AVI, DivX, MP4, MPEG-1/2, MPEG-4 AVC, WMV, 3GP, and FLV video. It is not only a DAT video converter, but also an audio extractor to extract MP3 and M4A audio from DAT video. 4Media DPG Converter is the essential video converter to convert all popular video and audio formats like AVI, MPEG, H.264/AVC, 3GP, VOB , DAT, WMV, MP4, DivX, MOV, GIF, RM, ASF, WMA, WAV, M4A, AAC, AC3, OGG, CUE, APE, CDA to DPG videos or MP2/MP3 audios for playback on Nintendo DS. 4Media FLV to 3GP Converter empowers you to convert FLV to 3GP/3G2 video files in batches at high speeds, thus solves your problem of watching FLV videos downloaded from YouTube on 3GP mobile phones. Besides, you can make photos into 3GP video file. 4Media FLV to AVI DivX Converter is an essential FLV video converting tool to convert Flash Video files (FLV) to AVI/DivX/XivD videos or MP3/WAV audios for playing them on Windows Media Player and other popular media players. 4Media FLV to MOV Converter empowers you to convert FLV to MOV video files in batches at high speeds, thus solves your problem of watching FLV videos downloaded from YouTube on QuickTime player. Besides, you can make photos into MOV video file. This FLV to MP4 converter software can convert FLV files to MPEG-4, MOV, H.264/MPEG-4 AVC videos for playback on various MP4 players, and extract M4A, WAV, MP3 audios from FLV videos. 4Media FLV to MPEG Converter is a dedicated FLV video converter which converts FLV to MPEG1/MPEG2 video files for burning them to VCD/DVD disc and creates MPEG video file from JPG, PNG, BMP, GIF pictures in multithreading and batch-processing mode. 4Media FLV to SWF Converter is especially designed for converting FLV videos to SWF files for streaming on the internet more easily. You can make photos of JPG, PNG, BMP, GIF formats into SWF video file as well. 4Media FLV to WMV Converter is a professional FLV to WMV converter tool which can convert FLV videos to Windows media files including WMV, ASF videos and WMA, WAV, MP3 audios for playing on Windows media players. 4Media iPhone Video Converter is the best iPhone converter software to convert all video files such as MOV, MP4, RM, RMVB, DivX, ASF, VOB, 3GP, WMV, MPEG, AVI to iPhone movies. 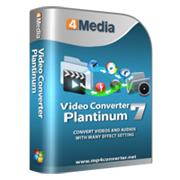 4Media MOV to FLV Converter is a QuickTime to Flash video converter that allows you to convert QuickTime MOV video to Flash FLV video. And it also supports converting pictures to Flash FLV videos. 4Media MOV to MP4 Converter is designed to let you enjoy videos on your MP4 player since it can convert QuickTime MOV video to MP4 and MPEG-4 AVC video. Additionally, it can create MP4 video from your picture collections. 4Media MTS Converter can convert H.264/MPEG4 AVC HD videos (*.m2ts, *.mts) recorded by AVCHD camcorders to HD/SD video files, thus helps you accomplish the transferring from AVCHD camcorders to PC media player or multimedia devices. 4Media PS3 Video Converter (PSP video converter also) is the first PS3 Converter which supports converting movie files to PS3 video, PSP movie with 480p, 720p and 1080p high-definition in the world. 4Media RMVB Converter is an easy-to-use RM RMVB converter that can convert Real Media (RM/RMVB) and other videos including FLV, MKV, MPEG, MP4, WMV, ASF to AVI, DivX, MP4, MPEG-1/2, MPEG-4 AVC, VOB, XviD, WMV, 3GP, 3G2 videos. As a smart video to Macromedia Flash SWF converting tool, 4Media SWF Converter lets you easily convert any videos/audios into SWF files for web upload and streaming, and even create HTML webpage with SWF file directly. 4Media Wii Converter 6 is able to convert your Nintendo Wii to a movie and music player by converting most popular videos/audios to Wii movies and music. 4Media WMV 3GP Converter combines WMV converter and 3GP/3G2 converter into one. That's to say, it enables you to convert 3GP/3G2 to WMV and WMV to 3GP/3G2 video to fit your multimedia devices or 3GP phones. 4Media WMV MP4 Converter helps you convert video formats from MP4 to WMV, WMV to MP4 and WMV to MPEG-4 AVC. It has the audio extractor function to extract audio from MP4 and WMV video to WMA and M4A audio. 4Media Xbox Converter is a professional Xbox video conversion software product to convert AVI, MPEG, WMV, MOV, MP4, RM, RMVB, DivX, ASF, VOB, 3GP and FLV videos to Xbox movies. It also supports HD video conversion. 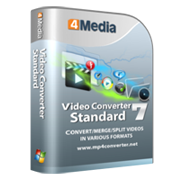 4Media XviD Converter is specially designed to convert AVI, MOV, MP4, MPEG, RM, VOB, MKV, WMV, 3GP to XviD, AVI, DivX, MOV, MP4, MPEG-1/2, MPEG-4 AVC, VOB, WMV, 3GP videos with high converting speed.